Belgium has raised the terror alert in Brussels to the highest level fearing an attack “like the one that happened in Paris” last week, PM Charles Michel says. The fear was that “several individuals with arms and explosives could launch an attack… perhaps even in several places”, Charles Michel said. Some of the attackers who killed 130 people in Paris lived in Brussels. Paris attacks leading suspect Salah Abdeslam is believed to have gone back to Belgium. A huge manhunt is under way. The Brussels metro is closed till November 22 and people have been told to avoid crowds. These include shopping centers and concerts, and the authorities have also recommended that large events, including football matches, be canceled, a statement said. The warning for the rest of Belgium stays at a lower level, which is still at a “serious” level. The Belgian government will review the security situation in Brussels on November 22, Charles Michel added. 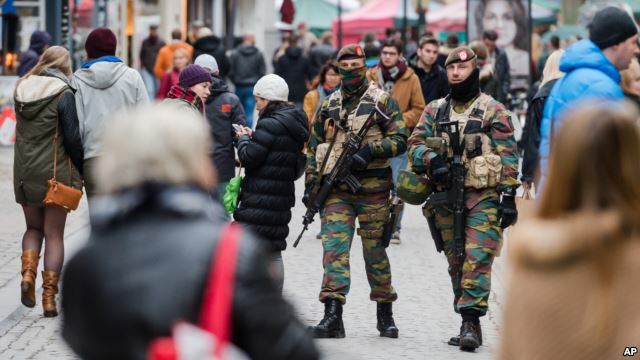 Interior Minister Jan Jambon earlier told reporters Belgium’s situation was “serious”, but “under control”, as he arrived for a special security cabinet meeting on November 21. Turkish police say they have arrested a Belgian man of Moroccan descent on suspicion that he scouted out sites in Paris, Turkish news agencies report. The Belgian authorities have so far charged three people with involvement in the attacks, which ISIS said it carried out.